Lake Effect's Stephanie Lecci interviews work/life fit expert Cali Williams Yost. As smartphones keep us ever accessible, email creates instant communication, and work increasingly slips into what used to be known as "after hours," it's no wonder many of us find ourselves wishing there were 25 hours a day. Cali Williams Yost explains how small changes can help us achieve our work and personal goals. It seems like no matter how hard we work, it's increasingly difficult to get it all done - and to have a satisfying personal life outside of the office at the same time. Many people look for a so-called "work-life" balance, but that's a term eschewed by Cali Williams Yost. She is the CEO and founder of Flex+Strategy Group/Work+Life Fit Inc. - which helps businesses and employees create flexible work environments that allow for fulfilled personal time. She says we struggle to fit our work and life together because we don't have certain boundaries anymore. "Basically we all know that there used to be clocks and walls that told us when work ended and the other parts of our lives began, and over the last twenty years, because of technology and global competition, those clocks and walls have disappeared," she says. Yost says it's not about finding a balance, but about finding a good fit - determining how your work and personal goals can figure into your daily schedule. 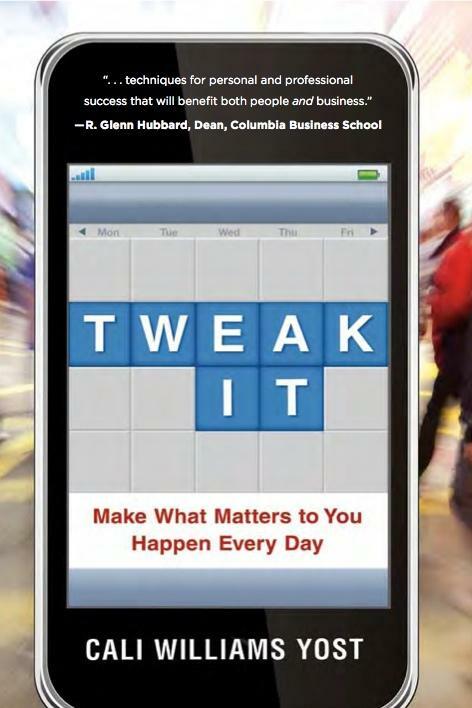 In her new book, Tweak It: Make What Matters to You Happen Every Day, Yost explains how small changes to our daily priorities - a.k.a. "tweaks" - can yield big results for our professional and personal lives. Yost says some people - who she calls "naturals" - who just get how to figure out the work-life fit, while the rest of us struggle without boundaries. "We've all been thrown into the work flexibility pool without lessons and most of us are still hanging on the side of the pool, trying to figure out how to move forward, or we're trying to doggy paddle and we can't really get where we want to go," she says. "The naturals just started swimming." By observing and detailing three key strategies of these "naturals," Yost hopes to help the rest of us catch up and take an active role in managing our lives. Yost emphasizes that making work and life fit in a manageable way is about more than just time management. Instead, we need to consider the elements of "what, where, when and how" into how we organize and approach our priorities. For example, if you struggle to manage work emails and find time to get to the gym, can you answer emails while you are on a recumbent bike? Tip: Yost suggests keeping your work and life to-do lists in the same place, or at least be able to look at both at the same time, to have the "complete picture" of what you want to accomplish. What do I want to accomplish at work? What do I want to accomplish in my personal life? Yost says based on your answers, you will be able to identify what "tweaks" you can make to your weekly schedule to fit in those meaningful goals or activities that are important to you. She says you should select "standard tweaks" to be done week after week, or unique "tweaks of the week" - things you're just going to try to accomplish that week. Yost says we should review and possibly revise the "tweaks" we've selected each week - and even each month or six months. "Life changes, and I think that's one of the parts of the whole work-life fit skill set that's so important, is to recognize that our lives don't stay the same, that realities change," she asys. "Or what happens is our definitions of success change, and what we want to try to accomplish is going to be different, so we're going to want to adjust that." Yost is one of Mashable’s Top 14 Career Experts on Twitter. She works with organizations like the US Navy to companies like JP Morgan Chase and Ernst and Young, to individuals to achieve flexible work options. Her previous written work includes "Work+Life: Finding the Fit That’s Right for You."